My husband LOVED it, as did everyone else who saw it! On November 6, 2015, from 6-10pm, Ladies Time Out at The Barn at O'Bistro on North Main St. in Wolfeboro, NH will feature a variety of events and items for sale, with food, dancing, and lots of fun just for women. This is a special event for you, ladies, to have a fun time with your friends. And it is all for a good cause: The Wolfeboro Area Children's Center. Join the fun, do some shopping, and help a good cause! ***Note: I will be donating 10% of all commissioned portraits that come from this event to the Wolfeboro Area Children's Center. I recently had a commission come in from Las Vegas, Nevada!!! That was exciting that I'm reaching pet owners across the country! See what Shawna had to say about Bandit under "Testimonials". My newest commissions have just been added - check out Rocky and Bear under Dogs in Portfolio! I think they came out great and my client is pretty happy, as well. See what he said under "Testimonials". For a lot of us, a pet is our best friend. Many people can't imagine their lives without a dog or a cat to share it with. For others, a parrot is their best friend. Some people love their horses or their goats or they have a favorite cow or pig farm animal friend. The kind of animal or its size doesn't matter, what matters is the special bond we develop with the animals we share our lives and homes with that leave us with a lifetime of memories. I share my life with several animals and like so many of you, can't imagine my life without them. Unfortunately, we often lose them much too soon either through an accident or an illness. But the feelings of sadness and close bond we have never leaves us. 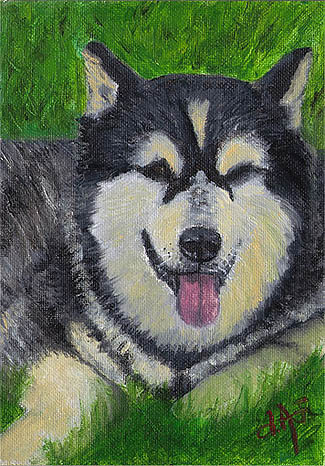 Whether you have just lost a pet or have one that is, to you, "Priceless", I will paint a portrait so that all those wonderful memories will live on forever, every time you look at your animal's portrait. To show my love and commitment to all animals, I donate 10% of my profits to local animal charities.